So, Phil Hughes turned in his best start of the year yesterday, allowing three runs on six hits in six and two-thirds innings, striking out seven, and walking just one. That's not to say Hughes was great, but it was his first quality start of the year, his seven strikeouts were a season high, and it was the deepest into a game he's pitched so far in 2012. He hit 96 miles-per-hour on the gun on his final pitch of the day (though said pitch was hit by Humberto Quintero for a home run). The start might have come just in time: With Mariano Rivera on the disabled list, the Yankees need a pitcher to cover the seventh inning, no matter who serves as the closer on a given night. That pitcher could be someone already in the bull pen — but as Hughes had been pitching himself out of the rotation in recent weeks, it has looked increasingly likely that he could be demoted to the bull pen, where he once excelled in a setup role. Now that Freddy Garcia has already been banished to the bull pen and replaced for the time being by David Phelps, no decisions need to be made about the rotation until Andy Pettitte is ready to join the big-league team. But this weekend, Andy Pettitte said that he thinks he's ready to join the big-league team. Pettitte's last outing wasn't especially impressive — he allowed eight hits and five runs (three earned) in five innings for the Yankees' nomadic Triple-A team, striking out five and walking two. But he threw 92 pitches, and afterwards, he said he believed any more time in the minors would be counterproductive. 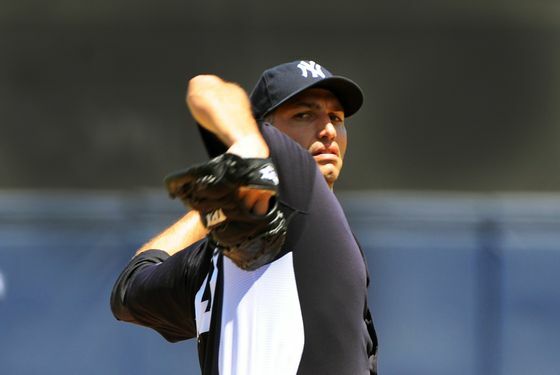 Said Pettitte, "I feel like I’m ready, and I think they’re ready for me to come up." Even if Pettitte's extended spring training and minor-league outings are more about building up arm strength than getting results, it's only natural to wonder if Pettitte, who hasn't pitched in the majors since 2010, can resemble the pitcher he was before he retired. A couple of lights-out starts against lesser competition would have been encouraging. According to the News, Joe Girardi and Brian Cashman will determine today whether Pettitte will make another minor-league start or join the Yankees. Presumably, if it's the latter, they'll also be deciding whose spot Pettitte will take. Yesterday was a big day for Hughes, but that decision could make today a big one as well.